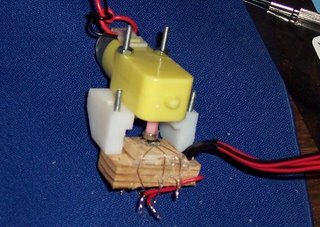 I finally got my nerves steady enough to do the fiddly soldering for the Austriamicrosystems magnetic shaft encoder. I used thin copper filament that I liberated from some #20 multifilament copper wire for the connections. I'm hoping that before the end of the year I'll be able to whip out polymer parts with Godzilla like Adrian does with the departmental Stratasys. For now, though, I'm repstrapping everything, so I used some scraps of Japanese plywood cut from a throwaway wood tray that I got with a log of naruto (Japanese fish cake). I've got a consulting deadline to meet before I can get back to doing the programming for this. It will probably be the weekend before I'll have a chance to get at it. Hopefully, I'll be able to test some programming for those Hamamatsu chips for limits detectors as well then. Unless you are using surface mounted ones?? Seriously, Al is so soft, I just hack of thick chunks (1/8") of oddly shaped scraps and screw them in place through an appropriatly sized drilled hole. The heat conducting paste is the key thing I suspect. Can be a time waster if you don't have the right tool sitting there waiting to be used though, but they don't need to be big or fancy, so a fresh hack saw will do it quickly. I've heard of some crazier guys just cutting it with their table saws. Apperently, it's extremely NOISY...! For the small motor in that gearbox, a chunk of aluminium extrusion is going to be enough. For the Frankenmotor, you might need to hack up old PC heatsinks! The G4 gearmotor is using a SN754410 chip without a heatsink. It's the L298N's that will be running the Frankenmotors that I'm going to need heatsinks for. When you decide to go brushless you can use them to do the communtation as well.